Celtic manager Neil Lennon has declined to comment on an alleged offensive banner displayed by supporters. The club were issued with a notice of complaint over a banner displayed during a July friendly match against Norwich City. The Scottish Football Association cited four alleged breaches of disciplinary rules, which all make reference to an "offensive banner". It is believed the banner makes reference to Rangers. The club have until 27 September to respond, with a principal hearing date set for 11 October. 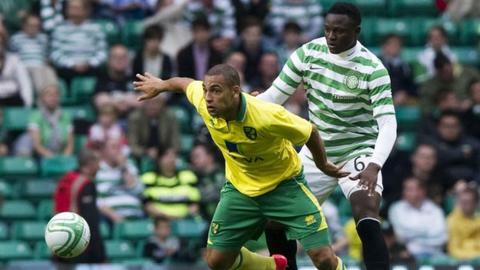 Norwich won the pre-season match at Celtic Park 1-0. The alleged rule breaches cite failures to "ensure the good conduct and behaviour of Celtic FC supporters" and "prevent misbehaviour by spectators" as well as allowing the banner to enter the ground and be retained by fans so it could be displayed a second time. Lennon said the matter was between the club's hierarchy and the SFA.